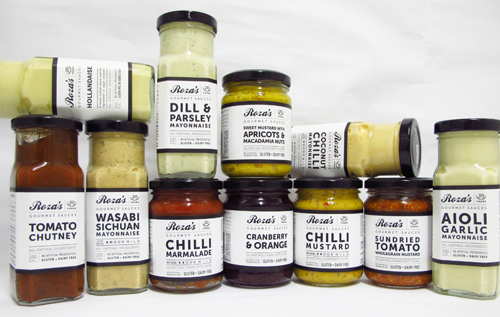 The right sauce can turn any meal into a feast, says Roza's Gourmet Sauces website at www.rozas.com.au. From humble beginnings in the kitchen of her residence, Roza Robertson and her recipes pioneered the gourmet sauce industry in Queensland. 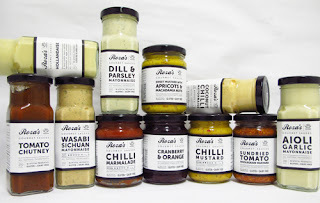 What began in 1991 as a simple way for the then-housewife to indulge in her passion for cooking quickly became a burgeoning business, as an increasing customer base took pride in purchasing Roza's Gourmet Sauces from the end of her driveway. With a focus on all products being 100% natural, Roza's Gourmet Sauces is a name synonymous for outstanding taste and quality. Aioli Garlic Mayonnaise - Made with bush honey and loads of garlic, this sauce is for the real garlic lovers. It's smooth, creamy, slightly sweet, and has a great texture from all the real chunks of fresh garlic throughout. Most popular for use on French fries it remains a delicious mayonnaise for sandwiches, meats, salads, and seafood. Coconut Chilli Mayonnaise - Loaded up with our fresh honey mayonnaise mixed with a soft curry powder and dessicated coconut. 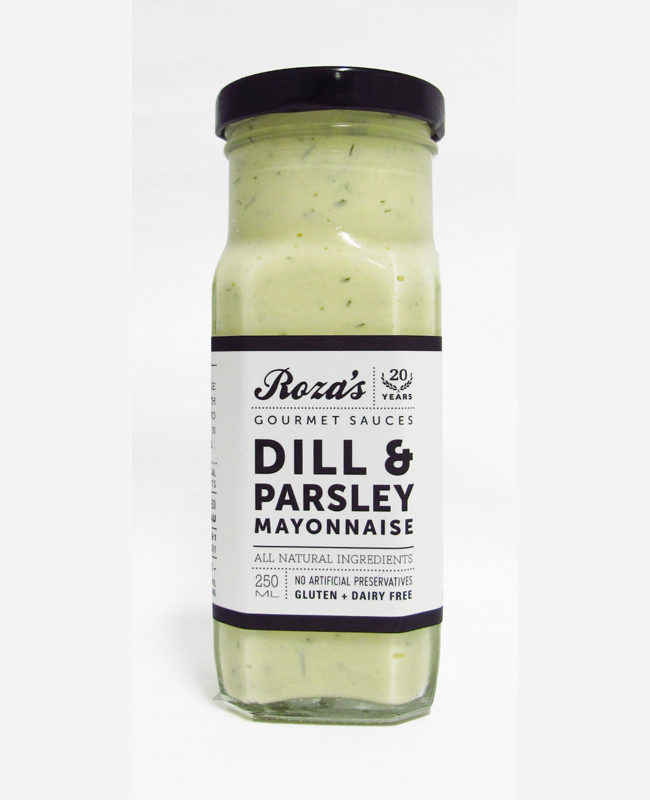 Mild on heat and strong on flavour, this is great for those who like to add a kick to salads, flavour to sandwiches and burgers, or sauce to meats and seafood. Dill & Parsley Mayonnaise - A lovely light and sweet mayonnaise. Extremely versatile, and filled with the freshest local dill and parsley throughout. Fantastic over some whiting or salmon, or mixed through a potato salad. Also, try it on sandwiches and as a side to any salad. Hollandaise - A rich and buttery sauce with a mild tang of lemon juice and spices. Unlike most commercial versions of this sauce it is all natural and will last up to 4 months in the fridge even after opening. Best served at room temperature for dishes such as Eggs Benedict and over warm vegetables, traditionally asparagus. Wasabi Sichuan Mayonnaise - Big on taste with just the right kick of spice.Roza's honey mayonnaise base is used, blended through ground Sichuan peppers, Wasabi paste, and fresh coriander to tantilise the tastebuds. It pairs well with seafood to enhance the natural flavours, brings excitement to a summer salad, and adds flair to a simple sandwich. Chilli Mustard - Roza's natural bush honey mustard base blended with fresh chilli - this one is great on sandwiches or to spice up any meat dish. It is a rating of 4/10 on the chilli scale, so it's hot but won't destroy the flavour in your meal. Sundried Tomato Mustard - Made with rich Italian sundried tomatoes and is a must for any tomato fan. Quite a flavoursome mustard, it also has a great contrast of texture between the soft chunks of tomato and the mustard seeds. Recommended on sandwiches, over vegetables, and with light meats - great warmed over a BBQ steak. Sweet Mustard with Apricots and Macadamia Nuts - This sweet and tangy mustard sauce is one of the most popular products in the Roza's range. Soft from the apricots with the crunch of macadamia nuts throughout, sweetened with honey but on a tangy mustard base. Great with hot or cold meats, cheeses, or especially nice with hot chicken or through a potato salad. Tomato Chutney - Made in the traditional style with sultanas andspices, this is one of Roza's oldest and most popular products. Serve as a side to filo, quiche, pie, or sausages, enjoy on a sandwich or burger, or serve warmed with your lamb and vegetables. People who try this delicious savoury chutney say it tastes just like the way their mother/grandmother used to make it! This sauce is vegan. Chilli Marmalade - Sweet yet spicy and loaded with ginger, this marmalade is a fantastic addition to a cheese platter, great through a stir-fry or with light meats and prawns. It is a rating 4/10 on the chilli scale, so not for the faint hearted but beautiful for a touch of spice - especially to a BBQ as it is great on burgers and with any type of meat or cheese. This sauce is vegan. Cranberry and Orange - We make our Cranberry & Orange with whole cranberries and orange rind pieces that we marinate in a butterscotch brandy - so it is never too sweet like many cranberry sauces can be. This makes it ideal for use with cheese and crackers, ham, chicken, and is very popular at Christmas for turkey. You can also enjoy it as a topping or side to desserts or even have it like marmalade on toast. This sauce is vegan. Huber's Butchery is located at 18A Dempsey Road Singapore 249677.